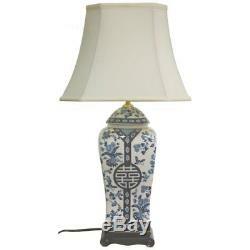 Oriental Furniture 26 Inch Blue and White Vase Lamp, Whites / Creams. Song Dynasty design for Asian interiors. Glazed porcelain vase with a carved Rosewood base. Flared, round silk fabric shade in soft ivory. Overall dimensions: 14W x 14D x 26H inches. Features a versatile 3-way switch for your convenience. The elegant and stately Oriental Furniture 26 Inch Blue and White Vase Lamp combines classic botanical decorations and stylized characters. Inspired by Song Dynasty designs, this distinctive piece in muted blue on ivory is the perfect choice for traditional and Asian-style interiors. Handcrafted by skilled artisans in China's Guangdong province, the porcelain base features a richly textured glaze. It rests upon a carved wooden plaque with a deep and rich Rosewood finish. A flared, round ivory silk fabric shade completes the look. This remarkable table lamp stands 26 inches tall and utilizes a convenient three-way light fixture. It requires a single three-way 100-watt, medium-base bulb, which is not included. What began in 1985 as a simple retail store in Natick, Mass. Has now blossomed into Oriental Furniture, one of the largest online retailers of furniture, gifts, and accessories. The company combs the globe for beautiful, quality products, and imports items directly from around the world in order to reduce costs for customers. With a wide variety of products available, Oriental Furniture offers distinctive design solutions for the style-minded home decorator. Requires one 3-way 100-watt, medium-base bulb (not included). This listing is currently undergoing maintenance, we apologise for any inconvenience caused. The item "Oriental Furniture 26 Inch Blue and White Vase Lamp, Whites / Creams" is in sale since Friday, January 19, 2018. This item is in the category "Home & Garden\Lamps, Lighting & Ceiling Fans\Lamps". The seller is "hayneedle" and is located in Middletown, Ohio. This item can be shipped to United States.